The Flathead National Forest has been violating these requirements that it wrote into its 1995 Forest Plan Amendment 19 based on grizzly bear research. 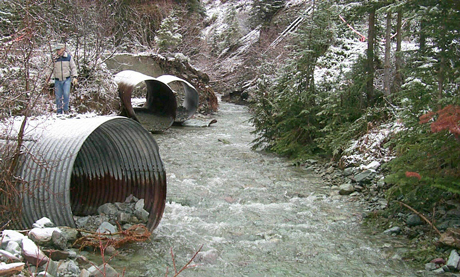 These requirements were intended to improve habitat for threatened bull trout and other aquatic life while securing habitat for threatened grizzly bear and other terrestrial wildlife. The Flathead intends to do away with Amendment 19 altogether in its revised Forest Plan, largely by reneging on/denying the scientific basis for what Amendment 19 requires! Click here for the Third Supplement. It describes how Total Motorized Route Density evolved from Total Road Density, how it is based in the South Fork Grizzly Bear Study (Mace and Manley 1993), and how in Flathead Forest Plan Amendment 19 it requires that roads be decommissioned, revegetated and removed from the "system" to lower TMRD. It also shows how Mace and Manley 1993 answered the Flathead's questions about how to calculate road densities, showed that Total Road Density must be considered in addition to Open Road Density, and points to why A19 capped the total miles of road that can exist in griz habitat due to the importance of roadless areas to female griz. Click here for the Second Supplement, which reviews Forest Service and Fish and Wildlife Service documents since 1995, confirming that Amendment 19 requires roads be decommissioned and no longer serve as a road or trail in order to not be counted in TMRD - serving as a cap on the miles of road that can exist in grizzly bear habitat. It also details how the Flathead NF has invented a new category of "impassable" roads to unlawfully substitute for road decommissioning. This leaves the roads available for both motorized and non-motorized use various parts of the year, without being counted in TMRD and hence allowing an unlimited number of such roads to exist in the habitats of threatened species like grizzly bear, lynx, bull trout, and threatened-candidate wolverine! Click here for the First Supplement to Keith Hammer's "Roads to Ruin" and "TMRD" Reports, which details requirements that reclaimed/decommissioned roads be revegetated and no longer serve as a motorized or non-motorized trail. Click here for the "Roads to Ruin: The Flathead National Forest Shirks its Road Reclamation Duties," which includes the TMRD report as an appendix. Click here to read how Swan View Coalition, Friends of the Wild Swan, and WildEarth Guardians have put the Flathead on notice they will sue over its lack of adequate road and culvert management!